Because we are in the cleaning business we realise that there is a need to save water however we can. Water is a precious resource and should never be wasted. Below we have indicated some water saving tips. We need water to survive and we also need water to keep our environments clean, whether it be at home or at work. 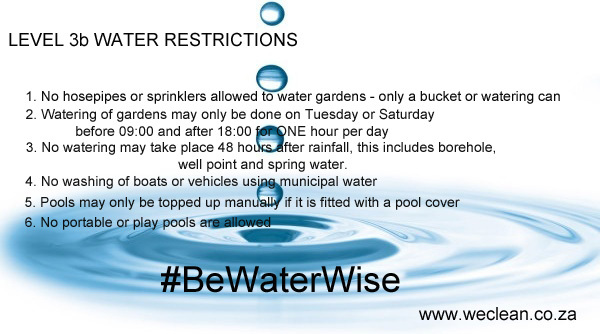 The Western Cape is currently at level 3b water restrictions. What are level 3b restrictions? What can you do to save water and be water wise? Here are some water saving tips. Install a grey water system or re use the water from your washing machine and shower. You can use this to flush your toilet and also to water your garden instead of using municipal water. Install water saving taps and shower heads. Take shorter showers, keeping a bucket in the shower to catch water before it goes down the drain. Before doing a load of washing, make sure it’s a full load instead of smaller loads. Use borehole or well point water wisely as well. Aquifers can also be depleted and run dry over a period of time. Install rain water harvesting tanks. This can be used to water your garden. Check for leaks around the house and fix them immediately. Let’s all #BeWaterWise and take care of one of the most important natural resources.